It feels like it has been raining for months. It hasn't - that's just me being dramatic. But it has been raining fairly seriously for the last week. So much so, the ceiling in an office at my work fell in over the weekend. Government buildings - so strong and well built..... Anyway regardless of the rain, I was going to BBQ over the weekend. Pretty much nothing can stop me once I get that idea in my brain. There are some good reasons for BBQ-ing in the rain - firstly, it is too wet to hang clothes out, so I don't have to worry about getting clean clothes all smokey. Secondly, I can't be bothered going anywhere, except to the butcher and the bottle shop. Suffice to say, my weekend was sorted! The plan for Saturday was lamb ribs and a magical cut of beef my butcher wanted me to try. Apparently it comes from the shoulder blade and is not always available, so I figured I would give it a go. I went on my weekly visit to East Blaxland Butchery, talked BBQ for a while with Scott and left with a 6 kg AAco brisket, a couple of lamb rib racks and the stunning piece of blade. The blade went on at about 1pm. I set the trusty (very old, very dodgy, very unstable) "practice" weber up using the snake method. I am saving my good Clean Heat Charcoal briquettes for upcoming comps, so I picked up some cheap Bic briquettes from Coles (they were on special, half price!). They sort of looked like Kingsford briquettes, just much bigger. Their size made the snake a bit tricky, but I managed. I used a a banksia cone out of my backyard and some other pieces from the Ministry of Smoke which were lying around. Mostly cherry I think. 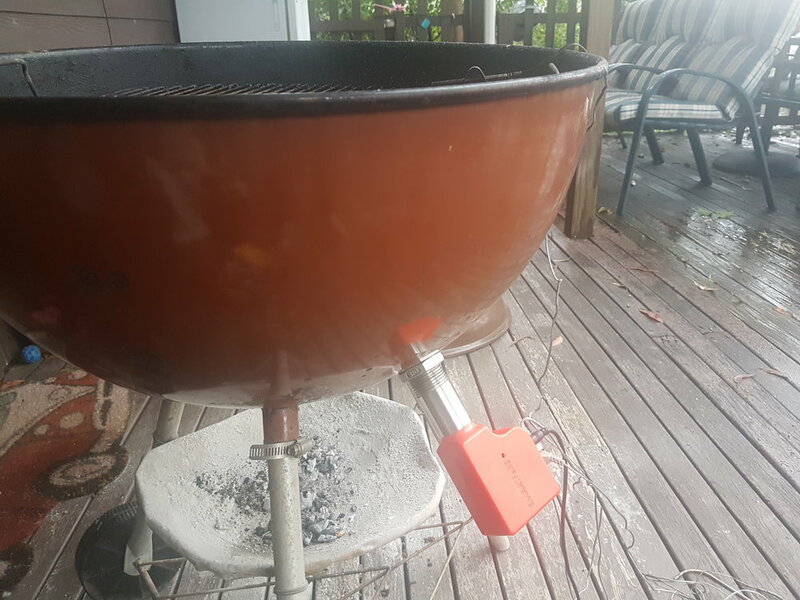 I set up the Smartfire for this cook - it is an awesome little gadget which makes BBQ almost too easy (almost, not quite though!). Make sure if you are using a Smartfire, you place some foil on the grill over the opening, so no coals fall into the unit. The Smartfire makes it very much "set and forget" which suited me because it wasn't really the weather for sitting outside marveling at the wonder that is BBQ. I set the pit to 250f for starters and off it went. It all worked beautifully - the Smartfire has a built in fan, and will self regulate the amount of air required to keep the pit at temp. It really is an amazing product - it works using your WiFi and your phone/ipad (I am not sure exactly how, but the creator of the Smartfire, Mark is the man with all the knowledge!) so you don't have to be within a certain distance of unit. It can be used on Apple or Android devices. One time, I left my partner home with the Smartfire while I went to pick my daughter up 1.5 hours away. I monitored it for the whole drive from my phone and let her know if she needed to do anything to it. 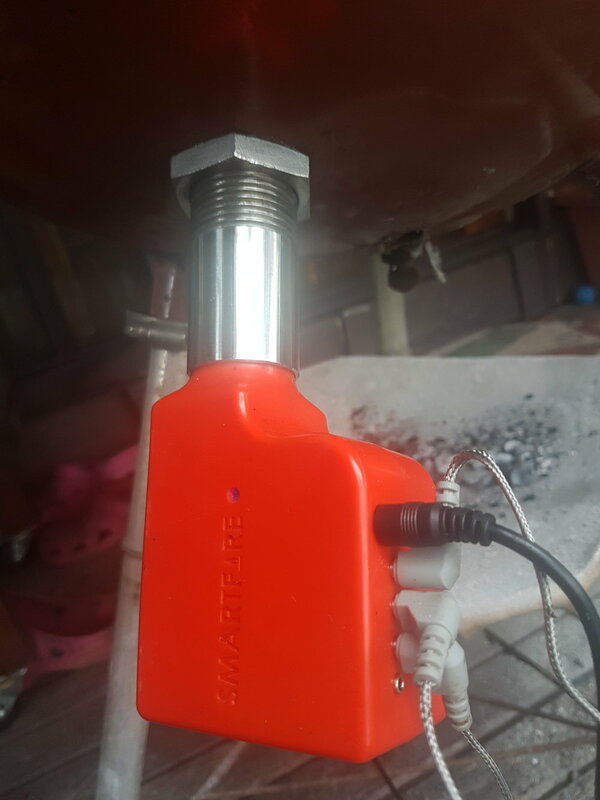 Perfect BBQ peace of mind! 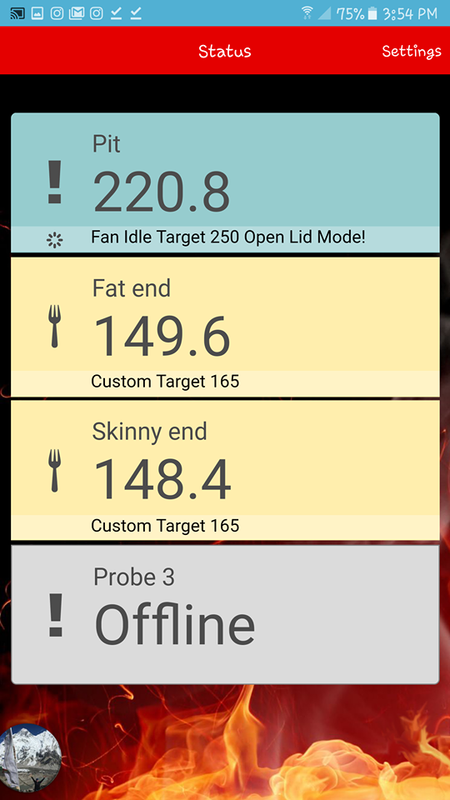 The following photos show the set up of the Smartfire on a Weber, a screenshot of the temps and the meat set up over the snake method. So I treated the blade like a mini brisket.I rubbed it using Emus Rub hot rub (you have to try this stuff!! ), took it to 165ish internal and then wrapped in foil. Important tip - make sure you spritz once the bark starts forming. Every half hour or so. This will help get you a nice pink smoke ring. You can use water, stock, cider vinegar, Worcestershire, really whatever you like. So once it was wrapped, I let it do its thing until it hit that glorious 203f mark. I then rested for an hour or so wrapped in towels in an eski. I then moved onto the lamb. I had used the sweet chilli marinade from the Bar-B Shack to marinade my lamb ribs for an hour or two before they were ready to go on the BBQ. Len from Bar-B Shack swears by lamb ribs that have been marinated in this stuff. I haven't really done much marinading of BBQ cuts because I usually just dry rub, but I was more than willing to give this a try. They went on for about 2 hours and I used the Bar-B mop to mop more of the sweet chilli juice on top of the lamb every now and then. What I should've done was seared the fat on top a bit after they were ready to get it a bit crunchy, but I forgot this step. Still, they were delicious. They had a great bite through, with a good amount of resistance but still really easy to eat. I would recommend them and the marinades to anyone! Once the blade had rested, I sliced it up. Holy moly - it was devine! It really was quite magical. Scott was right! It was so tender and bite through and juicy (dare I say, moist?!). Absolutely amazing! A very successful day all around, even with the crappy weather! 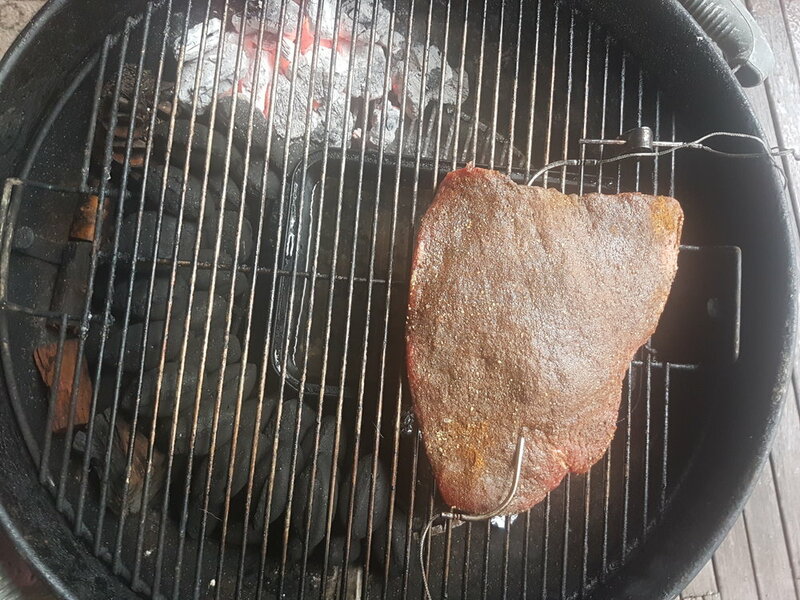 Sunday, I was up at 6am to get the brisket on the offset. I decided I should really get my practice up on an offset considering the smoker is coming in two weeks and I will not get to practice on it before Wollongong Crafted Live (that is going to be an interesting learning curve....). For the first time ever I used peach butchers paper (which you can get from BBQ Smokers) rather than foil to wrap it. I used my brisket rub, which is mostly Emu Hot Coffee run with some sneaky extras thrown in. I took it to 165 (with lots of spritzing every half an hour) and then wrapped in the butchers paper. IT TOOK FOREVER TO REACH 203! I guess I am used to the foil really getting the heat up, but the paper does not wrap so tightly so I daresay it is similar to boating or just leaving it naked for the whole cook. Eventually, after about 11 hours in total, it got up to 203. The difference was immediately noticeable - the bark was still intact, and quite crunchy. So different to wrapping in foil, which softens the bark so much it nearly rubs off (sort of like the bark on the blade photo above). It tasted great and had a lovely smoke ring too. Leftovers went to my work mates, and the rest into the slow cooker to make a beef brisket curry pie! All in all, it was a great weekend of cooking. Is it the weekend again yet?? The next time I cook a brisket, it will be on the new smoker. So exciting!! 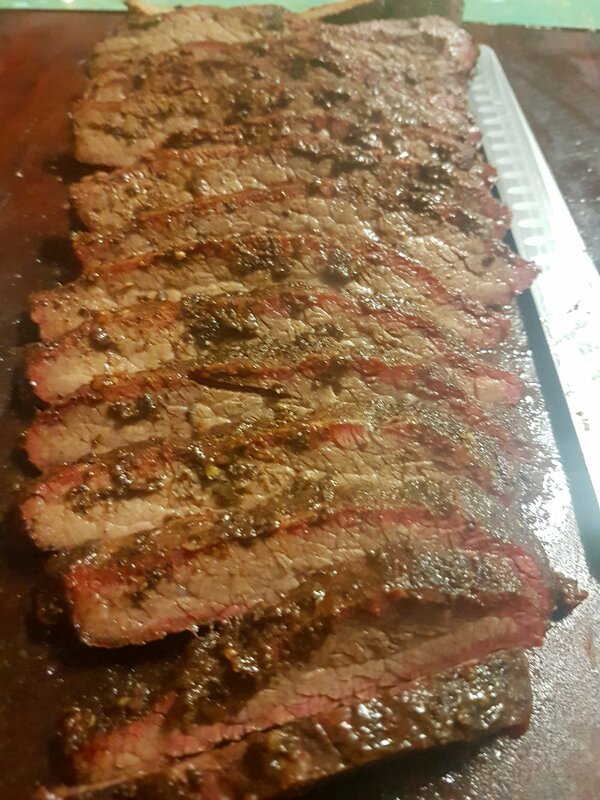 The 11 hour brisket - totally worth it!